Streamlining your holiday meal this year? 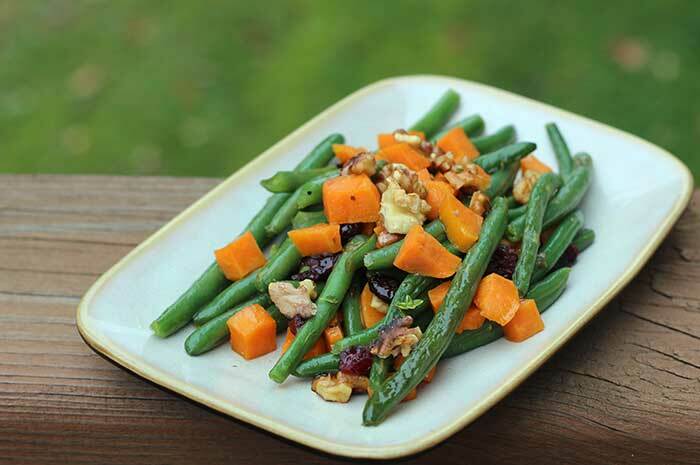 Green Beans with Sweet Potatoes and Cranberries is the perfect all-in-one side dish. It’s vegan and gluten-free too. What’s Thanksgiving without green beans, sweet potatoes, and cranberries? Usually, covering all of those bases means cooking three different recipes. Now you can get all three in a single side dish. The recipe below may seem a little bit complicated, but you can do a couple of steps ahead of time. And remember, you only have to make one dish, not three! Roast the sweet potatoes. Just let them cool and then refrigerate until you’re ready to proceed with the recipe. Boil the green beans. Submerge them in ice water while they’re still hot. (This will help preserve their bright green color.) Drain and refrigerate. If you aren’t splurging for Thanksgiving, good for you! Any of the following simple changes will reduce the carbs in this recipe. In Step 2, soak the cranberries in vegetable or chicken broth instead of orange juice. Hit the finished dish with a little bit of orange zest for freshness. In Step 3, skip the orange juice and maple syrup and roast the sweet potatoes in olive oil instead. Leave out or reduce the amount of cranberries. Cut back on the amount of sweet potatoes. You can also check out my 5 Ways to Stay on Track for Thanksgiving. Place cranberries in a small bowl and pour 3/4 cup orange juice over to cover. Let sit at room temperature for at least 30 minutes. In a large bowl, whisk together remaining 1/4 cup orange juice, maple syrup, salt, and pepper. Stir in sweet potatoes and toss to coat. Spread on a rimmed baking sheet and roast, stirring once halfway through, 10 to 15 minutes. (You want the sweet potatoes soft, but not mushy.) Remove from oven and set aside. Fill an 8-quart stockpot halfway full with water. Bring to a boil and add the beans. Cook until just tender, about 5 minutes. Drain in a colander and rinse with cold water. Strain the cranberries, reserving the juice. Heat olive oil in a large skillet over medium-high heat. Add green beans in a single layer in the pan. Cook for about 3 minutes without stirring. Stir in sweet potatoes, walnuts, and cranberries. Cook an additional 2 minutes or so, stirring occasionally. Add reserved orange juice and thyme. Stir well. Cook until most of the juice has evaporated, about another minute. Season with salt and pepper, if desired, and serve immediately. Make-Ahead Tips: Roast the sweet potatoes (Step 3), let cool, and refrigerate. Boil the green beans (Step 4), plunge them into ice water when they're still hot, drain, and refrigerate. Proceed with recipe just before you're ready to serve. You may need to increase cooking times slightly to make sure everything is heated through. Time-Saving Tips: Look for pre-cut sweet potatoes (or butternut squash). You can also use frozen green beans. Too many carbs? The majority of the carbs in this recipe are in the cranberries, orange juice, maple syrup, and sweet potato. In Step 3, you could skip the orange juice and maple syrup and roast the sweet potato in olive oil. You could also leave out the cranberries or cut back on the amount of sweet potato. This blog post is great and serves as a great guide to people like me who have diabetes. I have had diabetes for 10years and it has been a rough time though. Choosing what to eat has kept me alive and helped me dodge numerous complications. Being in college and at the same time being 21 is sometimes tough to deal with when you are diabetic. Anyway, I am trying to be better at eating. Mathenge – I can’t imagine dealing with diabetes and being in college at the same time. Either is stressful enough on its own! Good for you for being mindful about your food choices. If you have any tips you’d like to share, we’d love to hear them. I wish you continued success.